The factory pays Tk 240 a day for preparation of 10,000 bidi. She could lock around 1,000 bidi shells a day. factory in Lalmonirhat leaving her out of education, a basic right of children. Living in Kalmatirpara of Lalmonirhat district, she has been preparing bidi shells with her mother as a child labour since the age of five. Rokhsanaworks five or six days a week. Rokhsana can earn Tk 40 a day, totaling Tk 800 a month. Rokhsana learned bidi shell making from her mother. Later, to enhance household income she is utilising the skill. Although a student of class four, she stopped going to school giving preference to earning. As Rokhsana’s father is a landless day labourer, they have to be involved in bidi making aiming to bear all the household expenses. Like Rokhsana, many children have been working in bidi factories in Rangpur region to support their families, which put their health at risk. According to unofficial data, there are 35 bidi factories in Rangpur district that accounts for around one third of the total in Bangladesh. Around 40,000 labours are involved in bidi factories in Rangpur while grossly half of them are children, and among the adult labours one third are female. years, which is around 70 percent of the labour force. The age of the children working in bidi industry in Bangladesh ranges from 4 to 12 years. The Section 4 of the Children Act 2013 classifies anyone up to the age of 18 as child. However, according to the Labour Law 2006, minimum legal age for employment is 14 years. 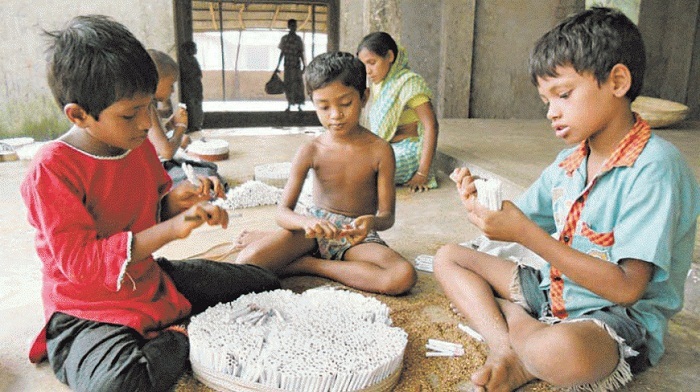 A study recently published in an international journal of behavioral and healthcare research says the number of actual child labour in bidi factories in Bangladesh is inconclusive while around 50-70 percent of the labours are children. only the children are raised and nurtured properly. in bidi factories in the northern part of Bangladesh. The study shows that children are unaware of the health hazards while working in bidi factories. Children suffer from malnutrition due to unhealthy work environment, use of tobacco and lack of balanced meals. child labour deprives children from their usual childhood activities. Noting that international conventions strictly restrict children from working in hazardous occupations like bidi production, he said, bidi factory employment is considered one of the most serious 38 listed hazardous jobs in Bangladesh.